I am completely invested into this moment and this interview. I am looking at it as the destination that has taken me a lifetime to reach, an achievement accomplished, a reason to believe. Now, before I start, I pause in whole wonder and awe struck contemplation and gratitude, and say thank you for this opportunity. I feel I am obligated to give back what was so freely taken. I owe this world some explanation and perhaps my balled up treasure map, guided by the compass of my heart, and each word written neatly in the blood of my pen, maybe it can help guide somebody through the Minotaur’s Labyrinth, as good books really never end. I love to read books, I get a lifetime of wisdom in one sitting, and I love all of those savory nuggets of golden thought to savor and think about, the golden nuggets of thought gathered by people who chip at them with pickaxes from the mines in their heart. I enjoy talking to people and finding their treasure, and all the gifts that come along with this. I know without a doubt it is the rainbow that is the true treasure, not the pot of gold at the end. I have written eight books but two need work and my latest one is just the beginning of a trilogy. 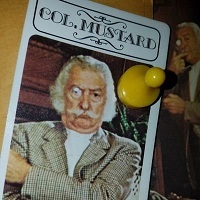 If you go to Smashwords or Barnes and Noble’s website and type in “Colonel Mustard” they will appear and you can download them for free. We who have struggled climbing up the mountaintop carrying our personalized giant boulder, we have developed strong muscles, carrying our own heavy burdens, uphill, alone, but we cannot make it to the top. We need to ask for help, help to carry and lighten our load, if but a little. We know even the smallest relief can be a great gift and a blessing, and each footstep up the mountaintop gained is a victory, by which we continue to need help with. It is in a moment of clarity, relieved temporary of our burden, when a miracle may happen. How beautiful when we realize we no longer need to carry our boulders and we can drop them. Carrying such heavy weight, we have grown strong muscles, and when relieved of it, we help others with their burdens, until they reach the pinnacle point when they realize they no longer need to carry their boulders everywhere they go and can let them go. I would like to help promote the creative gifts of the Mentally “ill”, that is a flag I would be honored to carry into the gates of Heaven, or maybe in the very least, a Queen Burger Joint or maybe even plant one on the moon. Enjoy these Free eBooks based on Real Delusions in an effort to show the Creative side of mental illness, the beauty, often times forged in flame. Questions? Suggestions? Star Yoke, the Blood of God, grants those who take it the powers of the Masters. The ToasterX pilot steals the Star Seed, capable of creating The Infinite, as Time Kneels, holding a Broken Shield. Death near, the Knights of Light have but one choice to survive, to enter the bodies of trees, prisons, left from an ancient advanced race. In Tree Form they wait until the day mankind can decipher the sunlight. I really do not know what to say, poetry can be so revealing, lower so many walls exposing one's heart, a very personal experience, that I feel a close relationship beginning between us, my heart is pounding fast, the compass I navigate with so perhaps I am on the right path, however I will not put out so easily, keep your hands to yourself! Ok, now Touch me! Give it! More! Oh I am a Poetry Store! A man, Chase, (Dreamwalker), an alcoholic with schizophrenia realizes he is just a memory of his brain that is severed and suffering in a jar. To end the pain, he must journey far on a quest to toss his brain into the fires of Sain. The brain summons Agents of the Mind from past life experiences to help Chase accomplish this, it calls upon three Agents, Socrates, Einstein, and Dr. Freud. Pretend you are a mountain, now plant a tree for the baby birds to sing, now if you are the words call out to your worms, furry birds, soft caress of flowers, feel inside the joy, an euphoric high for all to keep singing, to attract then attack the bees. This is a book of poems of Love, Life, and Laughter. It's like sleeping with a baked ham beneath the sheets. Words. Words inspire me to write, as each one is special and carries its own weight or image with it in my mind. The real craft of WordSmiths, the magic, is when we string words one at a time together and lead someone on their own journey in their own mind one image at a time. I think no two journeys are the same, as we all conjure different images for different words. I still find it fascinating how we have a never ending stream of thought, and some of those thoughts we speak out our mouths or body language, giving them life, and some we write down, anchoring the thought into the physical world. I am also incredibly inspired by Nature, Space, and the Great Unknown. Usually I only have a blurred image, when I begin, as if I am peering over the side of my boat into the water, and I see and sense something just below. It is my job to catch it, or, if I go far away in my dreams to photograph it, to experience the journey with you, and like a detective or an archaeologist, uncover it. It starts to grow as the plot takes form and together we give birth. Not one for outlines or notecards, I let the wolves in my mind loose and they charge through the herds of sheep looking to feed, I enter the pickle stand where any thought, memory or mental ill aliment or art, is bottled and collected on the shelves and can be bought, rethought or sold, I call to the sweet enrapturing temptress, my muse to seduce, as she sways closer in her dance bent leaning against the pearl fence and dragging her antlers behind with the medicine in back I am very aware of the small footprints of tiny toes she leaves and as the canopy of trees open she takes me deep, leading me into her soul mouth’s flame. I revise and print, revise and print, and go through many, many rough drafts before I am happy. Most of my main characters are based on my own experiences or inspired from real delusions. Each one could almost be, and in a way is, a split personality. There is a beauty to having these separate characters talk to each other and as the book develops it is usually funny to listen to them in my own mind and offer them the remote or a menu to what they want to say. Sometimes I will know instinctively what each character will say. There is always such a sweet kind of mourning process when the book is finished and the characters are silenced, and you are left to wonder, but this usually leads to the next project. My first advice is let your baby out of the closet. Don’t be afraid to show your work to people, and keep your confidence high, even if the critics give you lots of negative reviews, don’t let that steal your serenity or still your pen, believe in yourself and your abilities. For me to be turned on, I have to connect my plug into a higher source of power then myself, and I also have a switch on my back that I cannot reach. I need a person who believes in me and flips my switch on, and then once on, look out – Anything is possible! Also, as we all know, keep writing, keep on keeping on writing, every day if you can, even if it’s one line, and on the back burner of your mind have some sort of plot cooking, I especially love connecting B to C then back to A then over to E, you know the craft, the art, I find it very therapeutic and thought engaging. In my teens and twenties I sent out a ton of queries to publishers, and besides free ones, I always got rejected. Frustrated I took up a new angle, and sent with my first chapter along with the synopsis of my book a short note that simply said “Our mutual Friend John told me to send this to you.” When the publisher replied back to send the entire manuscript, I told them I really do not know John and do they still want my manuscript and they said No and were very insulted. This proved a point in my head and then drove it into my heart and for a long while I stopped writing… but I’m a writer. I need to write or it comes out in weird ways. One of my worst decisions was when Print on Demand, POD first started. It is a publisher who you pay to publish your book and then if orders come in they print them one by one. I jumped the gun in my excitement and printed four books. They picked the cover and they are horrible. I wish I would have edited them more and waited. Smashwords.com has been a dream come true for me. I have six ebooks they helped me publish. They have given my voice a mouth to speak from. I think they are top notch great and I am greatly indebted to them. They will all have to go digital. It will be too heavy and bulky to take all of the books to Mars when the Earth is collapsing in its final days and we destroy it. The books will have to be an ebook or similar format for us to save them on board our ships.